Pushes the item to select_lex.non_agg_fields() and updates its marker. Ensures that field, table, and database names will live as long as Item_field (this is important in prepared statements). Store the pointer to this item field into a list if not already there. 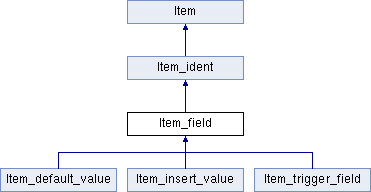 The method is used by Item::walk to collect all unique Item_field objects from a tree of Items into a set of items represented as a list. Item_cond::walk() and Item_func::walk() stop the evaluation of the processor function for its arguments once the processor returns true.Therefore in order to force this method being called for all item arguments in a condition the method must return false. FALSE to force the evaluation of collect_item_field_processor for the subsequent items. Reimplemented in Item_trigger_field, Item_insert_value, and Item_default_value. Set a pointer to the multiple equality the field reference belongs to (if any). The function looks for a multiple equality containing the field item among those referenced by arg. In the case such equality exists the function does the following. If the found multiple equality contains a constant, then the field reference is substituted for this constant, otherwise it sets a pointer to the multiple equality in the field item. This function is supposed to be called as a callback parameter in calls of the compile method. pointer to the field item, otherwise. Find a field among specified multiple equalities. The function first searches the field among multiple equalities of the current level (in the cond_equal->current_level list). If it fails, it continues searching in upper levels accessed through a pointer cond_equal->upper_levels. The search terminates as soon as a multiple equality containing the field is found. Check if an Item_field references some field from a list of fields. Check whether the Item_field represented by 'this' references any of the fields in the keyparts passed via 'arg'. Used with the method Item::walk() to test whether any keypart in a sequence of keyparts is referenced in an expression. Resolve the name of a column reference. The method resolves the column reference represented by 'this' as a column present in one of: FROM clause, SELECT clause, GROUP BY clause of a query Q, or in outer queries that contain Q.
if such a column is NOT found AND    // Lookup in outer queries. [in table T_j] in the SELECT and GROUP clauses of Q_k. Notice that compared to Item_ref::fix_fields, here we first search the FROM clause, and then we search the SELECT and GROUP BY clauses. Resolve the name of an outer select column reference. The method resolves the column reference represented by 'this' as a column present in outer selects that contain current select. In prepared statements, because of cache, find_field_in_tables() can resolve fields even if they don't belong to current context. In this case this method only finds appropriate context and marks current select as dependent. The found reference of field should be provided in 'from_field'. 1 column succefully resolved and fix_fields() should continue. Get timestamp in "struct timeval" format. If argument is NULL, sets null_value. Otherwise: if invalid DATETIME value, or a valid DATETIME value but which is out of the supported Unix timestamp range, sets 'tm' to 0. Simple transformer that returns the argument if this is an Item_field. The new item will inherit it's name to maintain aliases. Result type when an item appear in a numeric context. See Field::numeric_context_result_type() for more comments. arg A MY_BITMAP* cast to unsigned char*, where the bits represent Field::field_index values. Replace an Item_field for an equal Item_field that evaluated earlier (if any). The function returns a pointer to an item that is taken from the very beginning of the item_equal list which the Item_field object refers to (belongs to) unless item_equal contains a constant item. In this case the function returns this constant item, (if the substitution does not require conversion). If the Item_field object does not refer any Item_equal object 'this' is returned . This function is supposed to be called as a callback parameter in calls of the thransformer method. Reset this item to point to a field from the new temporary table. This is used when we create a new temporary table for each execution of prepared statement. Return used table information for the level this item is resolved on. For fields, this returns the table the item is resolved from. For all other items, this behaves like used_tables(). : Use this function with caution. External calls to this function should only be made for class objects derived from Item_ident. Item::resolved_used_tables is for internal use only, in order to process fields underlying a view column reference. Save a temporal value in packed longlong format into a Field. Used in optimizer. OUT field The field to set the value to. Reimplemented in Item_insert_value, and Item_default_value. Set a field's value from a item. This is only called from items that is not of type item_field. Mark the item to not be part of substitution if it's not a binary item. See comments in Arg_comparator::set_compare_func() for details. Check whether a field can be substituted by an equal item. The function checks whether a substitution of the field occurrence for an equal item is valid. Such a substitution is surely valid if either the substituted field is not of a STRING type or if it is an argument of a comparison predicate. Return date value of item in packed longlong format. Get date value in packed longlong format. NULL is converted to 0. Return time value of item in packed longlong format. Get time value in packed longlong format. NULL is converted to 0.